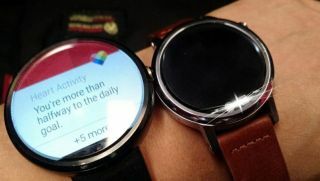 A new image has emerged that apparently shows the new Moto 360, the upcoming successor to Motorola's round smartwatch, and the original Moto 360 side by side. If the image is legitimate then it not only gives us an excellent look at the upcoming wearable, but also shows us how the next generation Moto 360 will differ from the one that came before. The new Moto 360 (whatever it ends up being called) looks set to be slightly smaller than the original, with the same almost-but-not-quite round watch face design. However rumours suggest that there will be two versions of the new Moto 360, with one being larger and with more battery capacity, which means we might be seeing the smaller version in this image. A lens flare effect also appears to have been placed over the bottom of the new Moto 360's screen, which, unless JJ Abrams got hold of the photo in Photoshop, suggests the person who leaked the image might want to obscure what's there. This could be an identifying marker that could tip off Motorola as to who leaked the image if it is real. If it's a fake, then this lens flare effect could be hiding some incriminating evidence. However, it looks identical to the watch in all the other leaked pictures we've been seeing. The photo was shared on the Hellomotohk Facebook page, where it calls the new Moto 360 the Moto 360s.